A few weeks ago, we had the opportunity to check out Mangroves in South Tampa for a Blogger Brunch. That day was my first time entering the doors at Mangroves and I knew quickly they wouldn't be the last. Mangroves has a certain feel to it - upscale and trendy without being pretentious. Not at all what I was expecting and this little gem surpassed my expectations. Gabe and I had the opportunity to check out Mangroves for dinner and after sampling the brunch treats, I knew we were in for a treat. The first thing I noted was the size of Mangroves menu. There were no more than 4 items per category. I usually find that restaurants who opt for smaller menus perfect their dishes vs. those restaurants who have a menu the size of a book. We started off with a pitcher of Sangria. Gabe is a HUGE fan of Sangria. His Sangria snob factor is equal to mine of wine. He told me multiple times that Mangroves Sangria was in his top two. The first thing I noticed on the dinner menu was the Crab Cakes with a coconut and macadamia nut crust, a mango slaw and pineapple buerre blanc. The coconut macadamia nut crust was a home run. It made this crab cake stand out from any other I have ever tasted. The bluerre blanc....I almost licked the plate clean. It was that good. Rich, sweet but not too sweet, rich, tropical. Then the crab cake - Gabe and I got in a discussion over the crab. It wasn't lump crab it looked like blue crab. I thought it was blue crab and Gabe said it couldn't be as it wasn't fishy. I asked and sure enough, I was right. Awesome job Chef! Once we heard the specials of the night, for the first time in our 3+ year relationship, this happened: Gabe ordered soup and I ordered salad. I am a soup girl and usually go straight for it. Not this time! 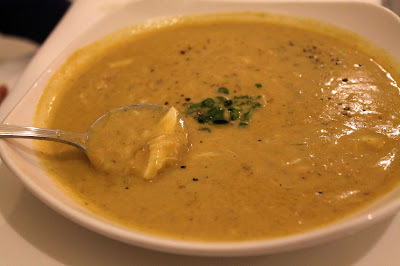 Gabe ordered the Creole Crab Bisque. It was very good and had a great amount of crab but in Gabe's words, just coming back from NOLA, it could have used a little more Creole spice. I am not knocking on the soup though, again, very good. The reason I opted for salad vs. soup was one word - cilantro. I am obsessed with cilantro and it is one of my favorite spices. I also have a weakness for a good Ceaser salad. With that said when I saw the Cilantro Ceaser on the menu, I knew I had to order it. There aren't many Ceasers that live up to my expectations. Mangroves presented me with a beautiful and delicious salad topped with Manchego cheese and I will surely order it again. While Mangroves had a great fish lineup, I was craving red meat. I have been to multiple food events over the past week who featured a lot of fish dishes (not complaining). Unless we are at a Steak House, I generally order fish or chicken. I also try to order opposite from Gabe but tonight, we both opted for a red meat entree. Mine - WOW. My first gut reaction was that I didn't want to order a Filet at Mangroves. 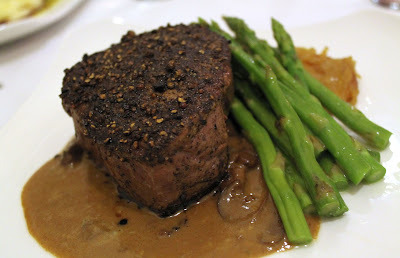 I am a Filet snob and Mangroves isn't a prime steakhouse. Yet our server strongly suggested it and I caved in, thank the lord. When I sit here and tell you that this filet was hands down up there with Ruths Chris, I am not lying or exaggerating. It was perfect, from the temperature it was cooked, the flavor and most important, the tenderness. It cut like butter and I loved every moment of it. Please - do yourself a favor. If you go to Mangroves for dinner, order this dish. Of everything I have ate this week, it was hands down my favorite. 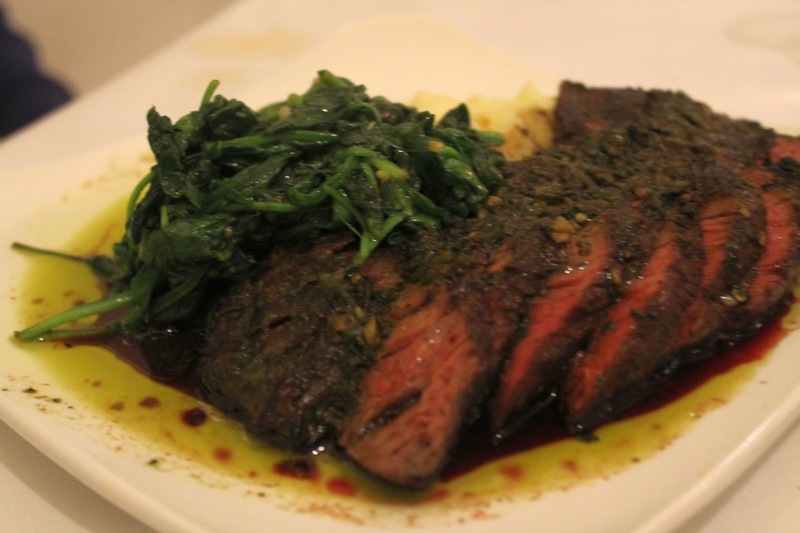 Gabe ordered the Chimmichurri grilled hangar steak. We are huge fans of chimmichurri and this steak was excellent. We are very familiar with Argentinian style steaks and I wasn't expecting to see it sliced but it was still a great steak. Overall Mangroves impressed me once again. I am very happy we were introduced to Mangroves and will be back to visit again! Wow - I never realized that Mangroves could deliver such an impressive meal...it looks and sounds amazing! Ahhh... Cilantro in a Ceasar salad? Awesome. I would love to try it...if they don't use fresh anchovies (unless I want 5 doses of benedryl to wash it down with!) Those crab cakes...insanity! I too, have had their filet..and I can confirm you are not exaggerating. Great read, Megan! It has been too long since I've had dinner there and you just convinced me I must change that asap!! Cilantro in a Ceasar? Awesome. You know I'm a cilantro freak too. Would love to try that but they probably use fresh anchovies (and I'd rather not overdose on benedryl following the salad!) That double stacked crabcake...wow...need. The filet...I've also had pleasure in enjoying a while back...I can confirm you are not exaggerating. It's killer. Great read, Megan. Its been too long since I've been there and you convinced me I need to go back asap!